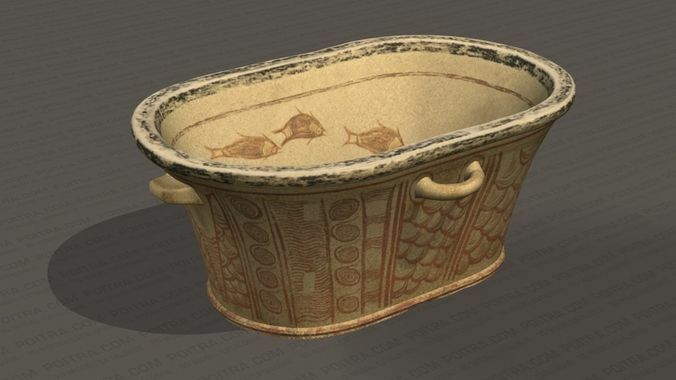 3D Model 14th Century BC Minoan Painted Clay Bathtub from Pachyammos in Northern Crete, with painted aqautic motif (c. 1350 BC) by POITRA Visual (Textured 3D Model). Such tubs were made for domestic use, but were sometimes used as coffins both on Crete and the mainland. Our 3D model measures approximately 4 feet wide by 20 inches tall (1.22 m wide by 51 cm tall). ACCESSORIES: Accessories may be available online (sold separately) and by custom request (contact us). CUSTOMIZATION: Customizations, variations, and remodeling are available by request (contact us). Original 3d model created in 3DS Max 2015 (native .max file). Other file formats, including earlier versions of 3DS Max and 3DS are available upon request. *Note: texture image map files are included with all exported versions, however, texture materials and map coordinates may or may not export or appear correctly in exported versions or in all target programs. There are, however, no known issues with this models exported versions. From the POITRA Visual 3d model catalogue (www.POITRA.com). Custom 3d modeling available (contact us!). POITRA was established in 1996 as a professional design communications company and has provided 3D services nationally and around the world. POITRA's 3d models have been featured in major television commercials, documentaries, movies, and developer and public works projects. POITRA strives for technical accuracy, realism, and visual appeal in every project.